Murnau, a Bavarian Alpine village not so far from Munich, a place of breathtaking beauty — bound to inspire. The years: 1908-1909. A time and place where magic might happen. It was, in fact, the best of times, and soon if not yet, the worst of times. For the moment, before the indiscriminate brutality of war ended and ravaged lives, and against a backdrop of growing political turmoil and complexities, there was an exciting flux of internationalism and flow of ideas in Munich among the avant-garde. The city was ‘the place to be.’ It was here that a group of German and Russian artists, including among others, Franz Marc, August Macke, Alexej von Jawlensky, Marianne von Werefkin, Gabriele Münter and Wassily Kandinsky, was to form Der Blaue Reiter (The Blue Rider) in 1911. Though lasting only from 1911 through the outbreak of World War I in August 1914, the group was extremely influential in the development of German Expressionism. 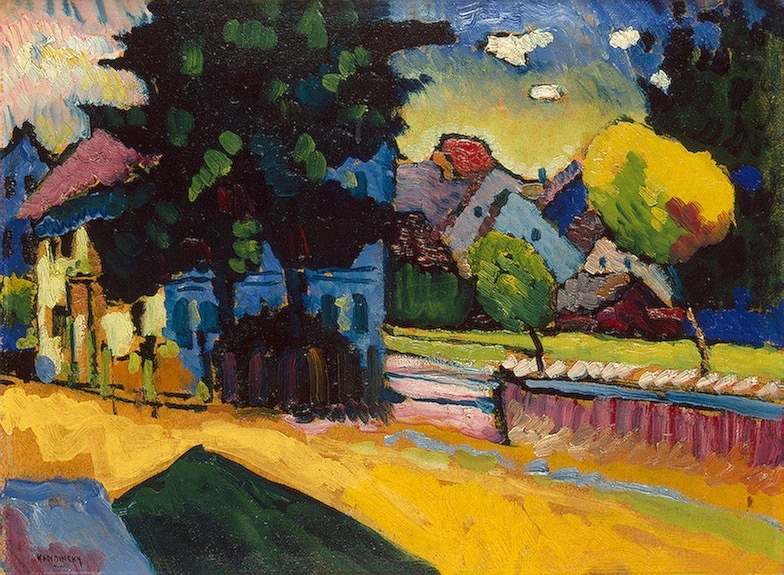 Four of these artists emerged as couples — Wassily Kandinsky and Gabriele Münter, Alexej von Jawlensky and Marianne von Werefkin — and in Murnau, during 1908 and 1909, they evolved the basic elements of Der Blaue Reiter. For Kandinsky (Russian), cofounder with Franz Marc (German) of Der Blaue Reiter, the pivotal 1908-1909 years in Murnau embody an important period of artistic and aesthetic development. These gorgeous, luminous works illustrate a transition from the early influences of Van Gogh, Gauguin and the Matisse-led French Fauvists, into an independent vision of increasingly abstracted forms and highly expressionistic use of pure colors and fluid marks that aligned with his evolving theories regarding the spiritual connection in art. The magnificent Dünaberg, 1909, exemplifies this clear new vision in its remarkable balance between figuration and abstraction. Kandinsky authored Concerning the Spiritual In Art (1910), a landmark book in the history of modern art, the same year that he is credited with the first non-figurative abstract work. This spiritual connection in art and symbolic use of color was fundamental to all the members of Der Blaue Reiter, despite their varying styles. 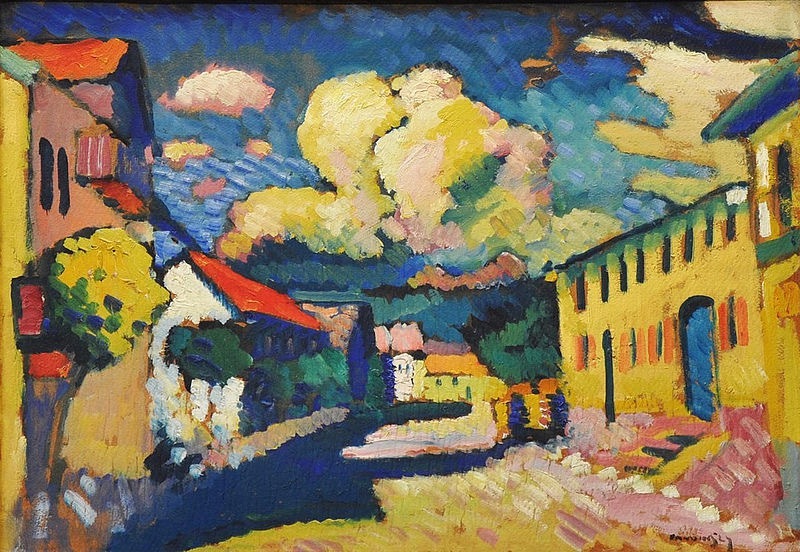 Wassily Kandinsky (Russian; Expressionism, Abstract Art; 1866-1944): Murnau, Dorfstrasse (A Village Street), 1908. Oil on cardboard, later mounted on wood panel; 48 x 69.5 cm, The Merzbacher Collection, Switzerland. © This artwork may be protected by copyright. It is posted on the site in accordance with fair use principles. Wassily Kandinsky (Russian; Expressionism, Abstract Art; 1866-1944): Murnau – Landscape with Rainbow, 1909. Lenbachhaus Art Gallery, Munich, Germany. © This artwork may be protected by copyright. It is posted on the site in accordance with fair use principles. 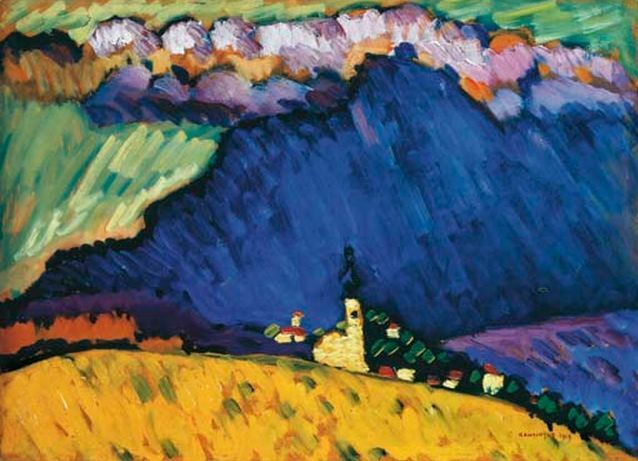 Wassily Kandinsky (Russian; Expressionism, Abstract Art; 1866-1944): View of Murnau, 1908. State Hermitage Museum, St.Petersburg, Russia. © This artwork may be protected by copyright. It is posted on the site in accordance with fair use principles. Wassily Kandinsky (Russian; Expressionism, Abstract Art; 1866-1944): Dünaberg, 1909. Oil on board, 13 x 17-3/4 inches (33 x 45 cm). Private Collection. © ADAGP, Paris and DACS, London. Image: © Invaluable, LLC. and participating auction houses. © This artwork may be protected by copyright. It is posted on the site in accordance with fair use principles. 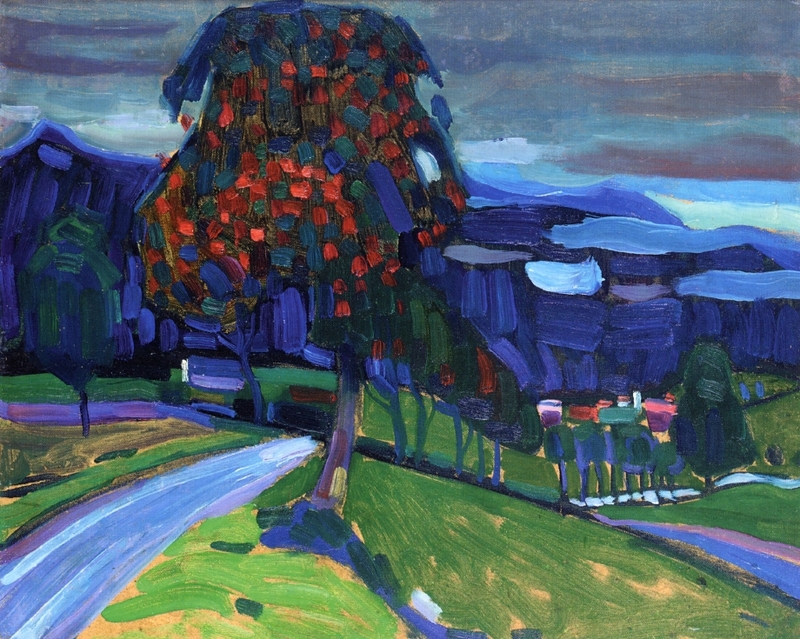 Wassily Kandinsky (Russian, Expressionism, 1866-1944): Autumn near Murnau, 1908. Oil on board, 32.3 x 40.9 cm. Private Collection. © This artwork may be protected by copyright. It is posted on the site in accordance with fair use principles. Art. Why does it matter? 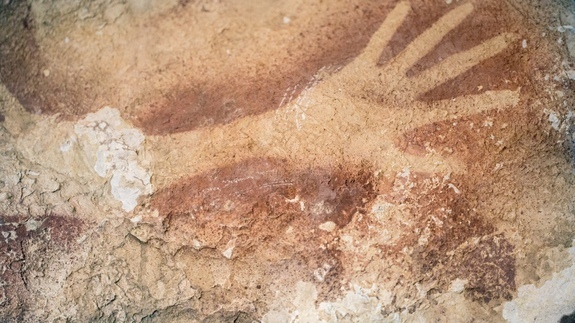 Hand stencil from a limestone cave on Sulawesi, an Indonesian island east of Borneo. Dated to a minimum age of 39,000 years ago, this may be Earth’s oldest known cave art. Two imprints of two hands separated by 40,000 years. One on a limestone cave wall, produced by a ground pigment that was blown over the hand, leaving an image of a slender arm and long outstretched, reaching fingers. 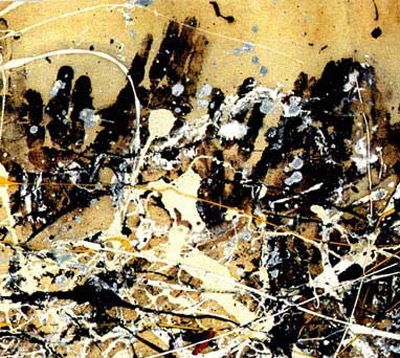 The other on a canvas, the hand dipped in paint and pressed onto the surface, layered with myriad drips, splatters and throws of paint by Jackson Pollock (1912-1956). Poignancy lies heavy, for captured in the same instant of these vigorous salutes to life, is the inescapable fact of individual mortality. Yet, in these two salutes to life, I am united with each. This ‘collapsing of time’ evokes a sense of continuity of life that far exceeds the limits of my own oh-so-short time here. These two striking examples of artistic self-expression, startlingly separated in space and time, share at their core a fundamental import. They speak to me now, today. They are, in a way, an ode to life. At its core, the urge to create is the urge to live, the desire for life. Whether we create, or enjoy that which is created by another; whether an artwork serves personally, or publicly, fulfilling civic or political functions — the larger significance of art, of the Arts, is immeasurable. It serves culturally and historically, identifying certain facts in terms of place and time. It serves a sense of humanity, perhaps aiding to formulate a vision of the continuity of humanity. And on occasion, it might allow for an easier vision of our commonalities versus our serious temporal divides and differences. Yes. Art matters. It imparts dignity, value and hope to the meaning of this human experience and suggests a profound significance beyond the limits of oneself. 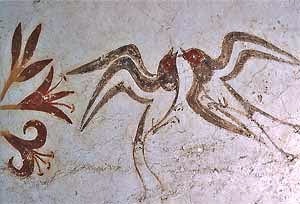 Minoan: Spring Fresco (detail, Swallows), ca. 1650 BCE. From Room Delta 2, Akrotiri, Thera, Greece. 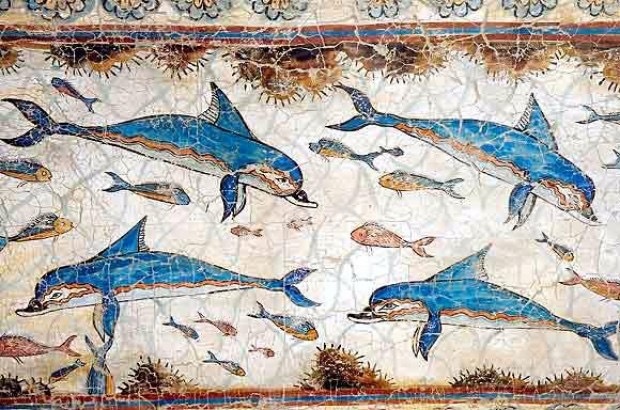 Palace at Knossos, Minoan, Dolphin Fresco, c. 1500 BC. Heraklion Archaeological Museum in Heraklion, Crete. Paul Gauguin, (French, Post-Impressionism, 1848- May 8, 1903): Where Do We Come From? What Are We? Where Are We Going? (D’ou Venons Nous / Que Sommes Nous / Où Allons Nous), 1897-1898. Created in Punaauia, French Polynesia. Oil on canvas, 54-3/4 x 147-1/2 inches (139.1 x 374.6 cm). Museum of Fine Arts, Boston, Massachusetts, USA. 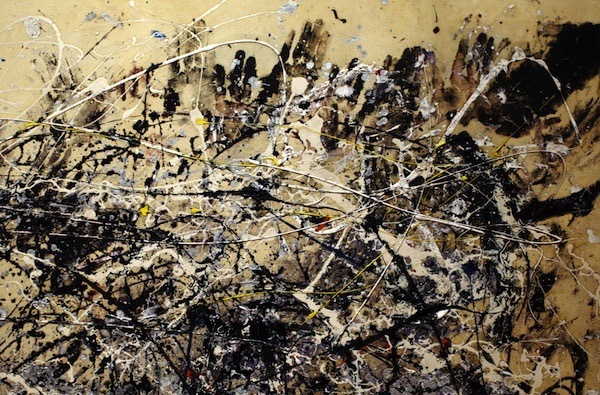 Jackson Pollock (American, Abstract Expressionism, 1912-1956): “Number 1A, 1948,” 1948. Oil and enamel paint on canvas, after conservation. © Pollock-Krasner Foundation/Artists Rights Society (ARS), New York. Image Courtesy MoMA. 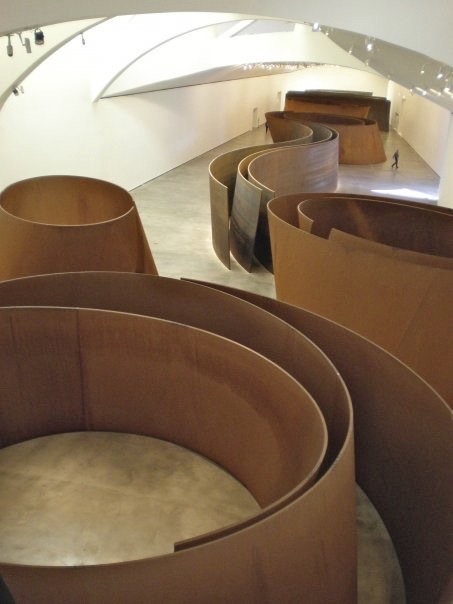 Richard Serra (American; Minimalism, Process Art; b. 1939): The Matter of Time, 2005. Installation of seven sculptures, weatherproof steel. Varying dimensions: length of over 430 feet, resides in a 32,000 square foot gallery. Guggenheim Bilbao Museoa. © Richard Serra/Artists Rights Society (ARS), New York © This artwork may be protected by copyright. It is posted on the site in accordance with fair use principles. 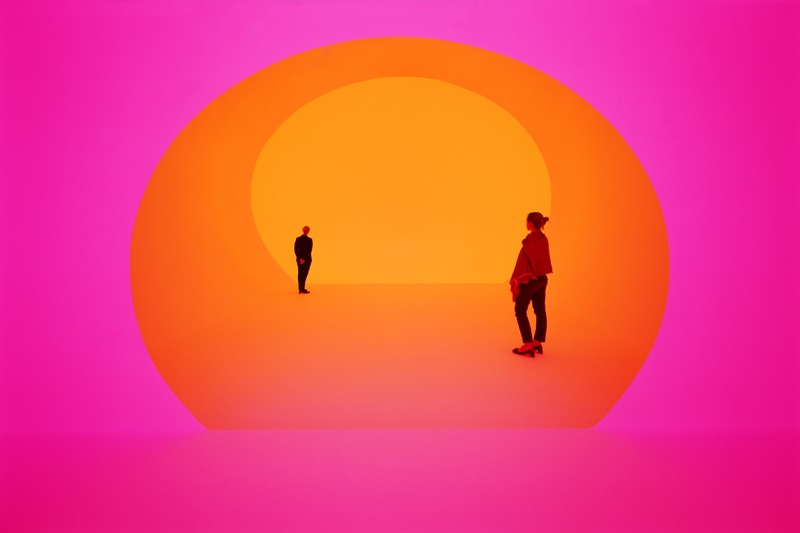 James Turrell (American; Contemporary, Post-Minimalism, Light and Space, Installation; b. 1943): Breathing Light, 2013. LED light into space. Los Angeles County Museum of Art, California, USA. © James Turrell. Photo © Florian Holzherr. © This artwork may be protected by copyright. It is posted on the site in accordance with fair use principles. 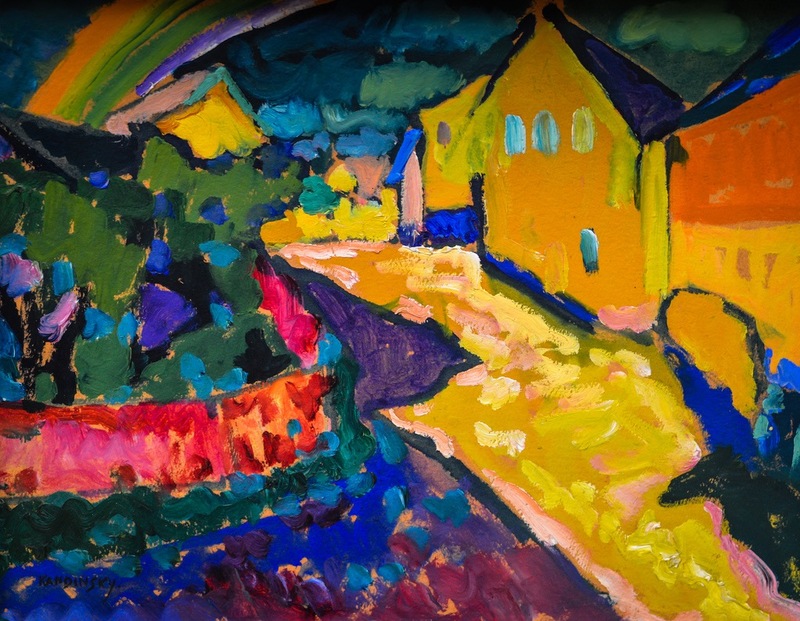 Munich-born Gabriele Münter (1877-1962), though denied entrance to the German Art Academies based on her gender, emerged among the leaders of the Munich avant-garde in the years preceding the outbreak of World War I. Up until the war, she participated in many of the most significant German avant-garde exhibitions. In 1902, she embarked upon a pivotal twelve year personal and professional relationship with Russian artist Wassily Kandinsky, then director of the short-lived progressive Phalanx School of Painting. Notably, in 1911, Münter was a founding member of the influential Expressionist group, Der Blaue Reiter (The Blue Rider), led by Kandinsky and Franz Marc. Members included Alexej von Jawlensky, Marianne von Werefkin, Franz Marc, August Macke, among others. Though the artists’ styles differed, they shared a fundamental desire to express spiritual truth through art. They believed in a natural connection between visual art and music and of the spiritual power of color. Though noting and observing Kandinsky’s stylistic progression toward abstraction, her own work remained figurative. 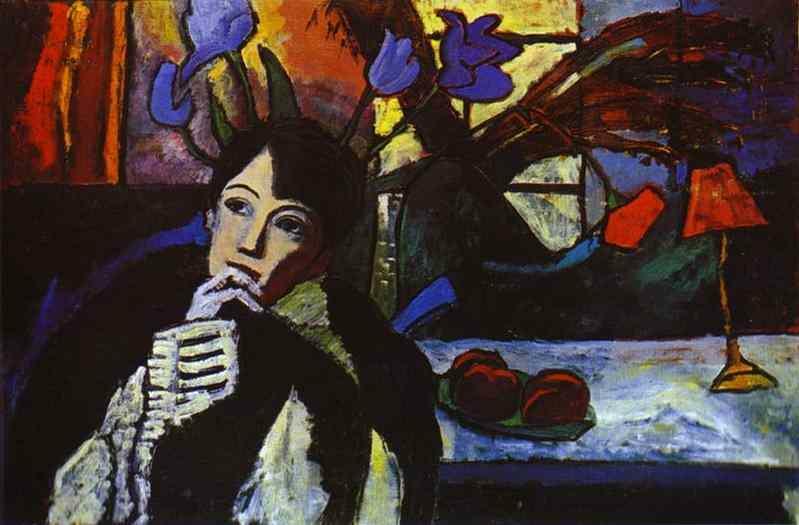 Her work evolved from the late 1890s Jugendstil (Art Nouveau) influences to incorporate the unusual colors of the Fauves and Post-Impressionists — Matisse, Gauguin and Van Gogh. Ultimately Münter’s work embraced the precepts of Expressionism in the emotive use of line and color, simplification of forms and flattened spaces and a movement toward primitivism. An early love of landscapes endured throughout. Her particular choice of emotive expression — color! To her lasting credit, Münter risked imprisonment during World War II by hiding her entire collection of Blaue Reiter artworks, over 80 oil paintings and 330 drawings, in her Murnau home. The works were deemed Degenerate Art. On her eightieth birthday she gave the collection to the Städtische Galerie in the Lenbachhaus in Munich. 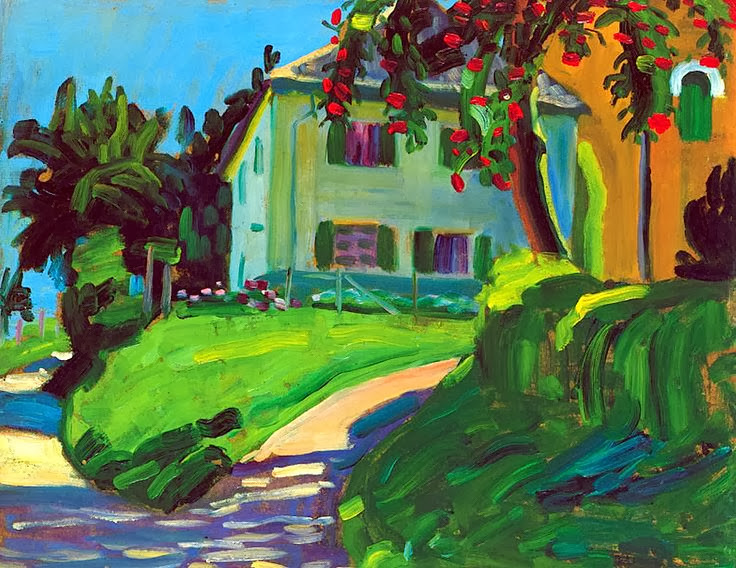 Gabriele Münter (German, Expressionism, 1877-1962): Sommer 1908 (Haus mit Apfelbaum), 1908. © This artwork may be protected by copyright. It is posted on the site in accordance with fair use principles. 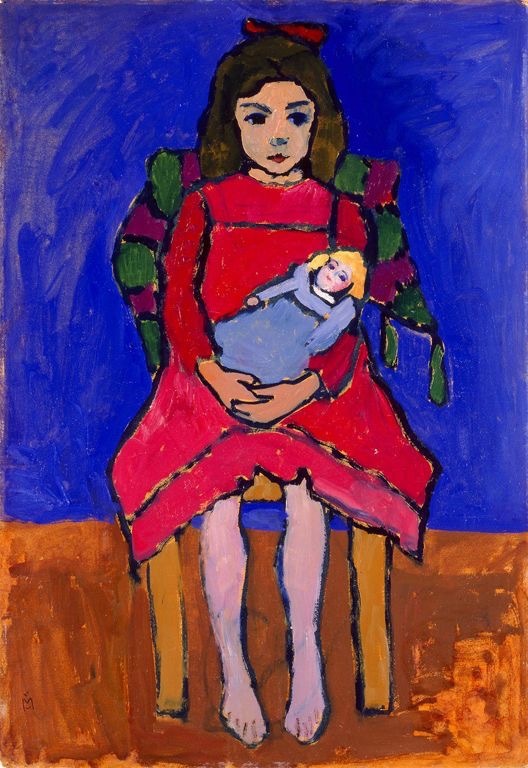 Gabriele Münter (German, Expressionism, 1877–1962): Girl with Doll, 1908–09. Oil on cardboard. Milwaukee Art Museum, Wisconsin, USA. © Artists Rights Society (ARS), New York / VG Bild-Kunst, Bonn. © This artwork may be protected by copyright. It is posted on the site in accordance with fair use principles. 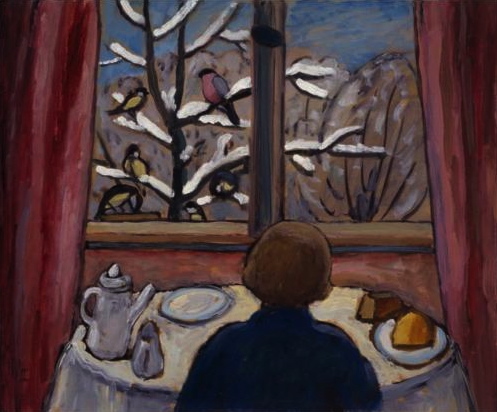 Gabriele Münter (German, Expressionism, 1877-1962): Breakfast of the Birds, 1934. © Artists Rights Society (ARS), New York / VG Bild-Kunst, Bonn. © This artwork may be protected by copyright. It is posted on the site in accordance with fair use principles. 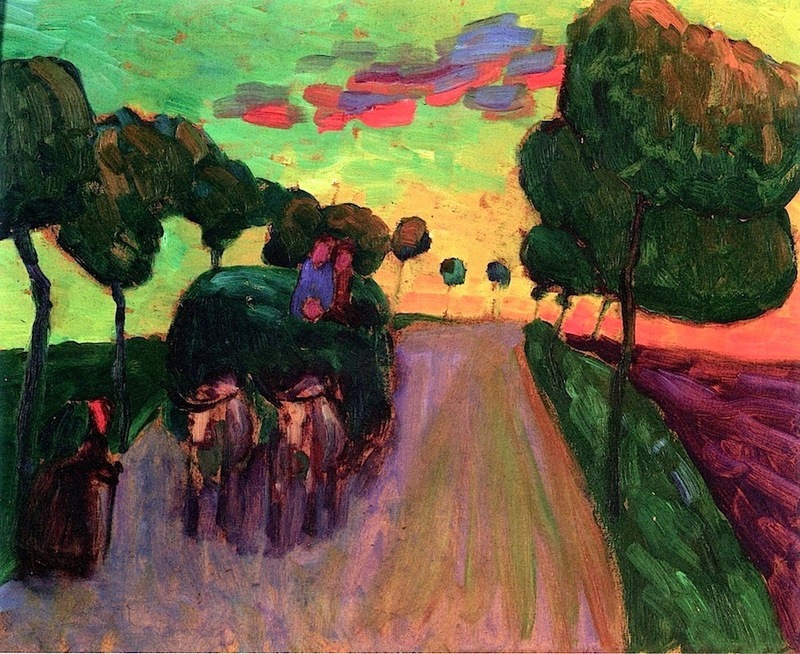 Gabriele Münter (German, Expressionism, 1877-1962): Study of a Haywagon (Entwurf Heuwagen), 1908. Oil on board, 33 x 40.6 cm (13 x 16 inches). Private Collection. © This artwork may be protected by copyright. It is posted on the site in accordance with fair use principles. 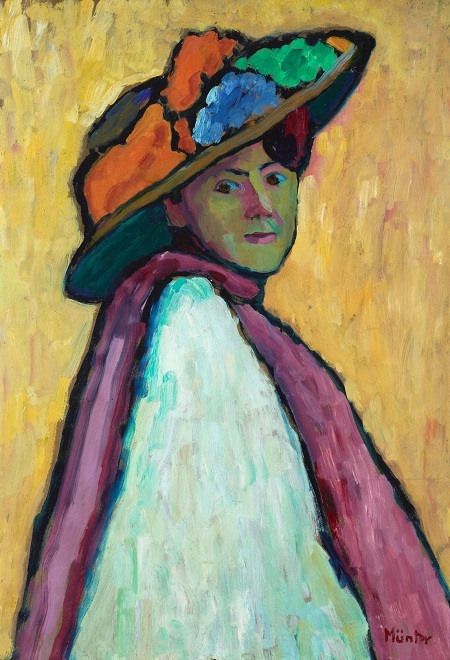 Gabriele Münter (German, Expressionism, 1877–1962): Portrait of Marianne von Werefkin, 1909. Oil on cardboard, 81 x 55 cm. Lenbachhaus, Munich, Germany. © Artists Rights Society (ARS), New York / VG Bild-Kunst, Bonn. © This artwork may be protected by copyright. It is posted on the site in accordance with fair use principles. 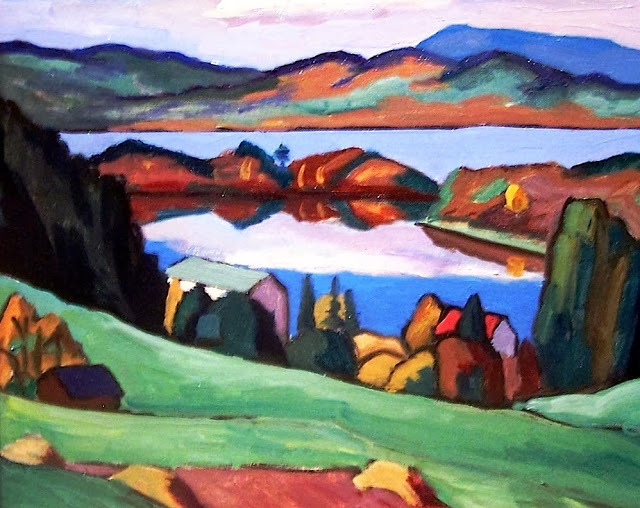 Gabriele Münter (German, Expressionism, 1877-1962): Staffelsee, 1920. © This artwork may be protected by copyright. It is posted on the site in accordance with fair use principles. 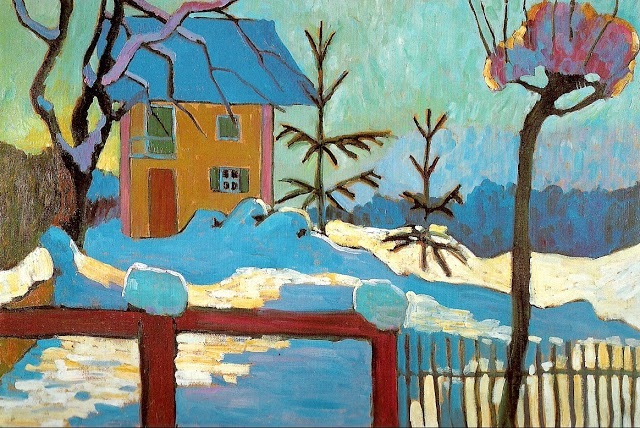 Gabriele Münter (German, Expressionism, 1877-1962): A House in the Winter Sun, 1909. Oil painting. © Artists Rights Society (ARS), New York / VG Bild-Kunst, Bonn. © This artwork may be protected by copyright. It is posted on the site in accordance with fair use principles. 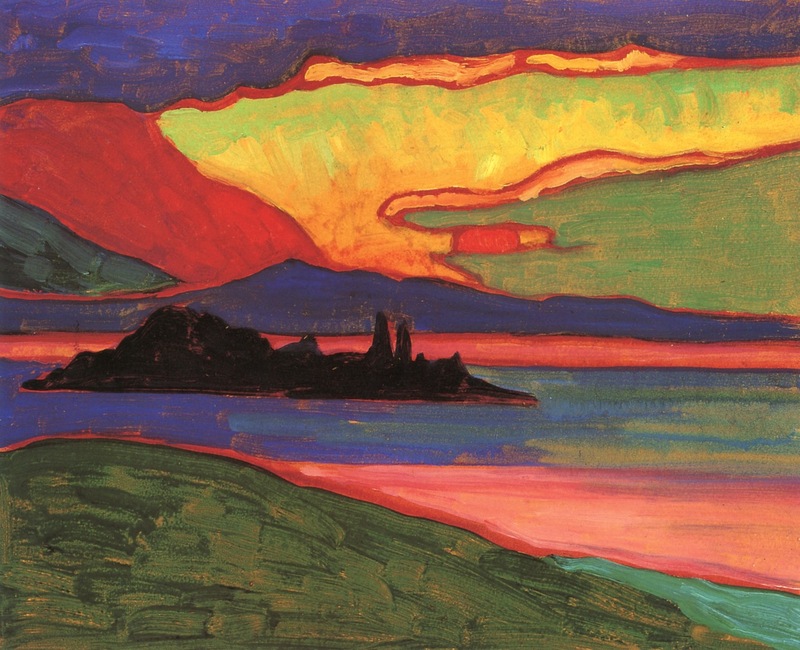 Gabriele Münter (German; Expressionism, Der Blaue Reiter; 1877-1962): Sunset over Staffelsee, 1910-11. Oil on cardboard, 33 x 40.6 cm (12.99 x 15.98 inches). Private Collection. © This artwork may be protected by copyright. It is posted on the site in accordance with fair use principles. Gabriele Münter (German, Expressionism, 1877-1962): Jawlensky and Werefkin, 1908-1909. Oil on card, 32.7 x 44.5 cm. Lenbachhaus, Munich, Germany. © This artwork may be protected by copyright. It is posted on the site in accordance with fair use principles. 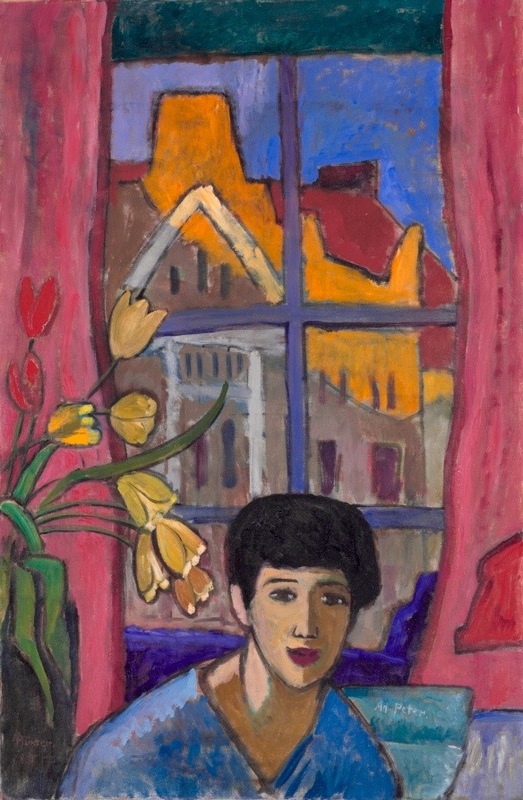 Gabriele Münter (German, Expressionism, 1877–1962): Future (Woman in Stockholm), 1917. Oil on canvas, 97.50 x 63.80 cm (38-3/8 x 25-1/16 inches). Cleveland Museum of Art, Ohio, USA. © Artists Rights Society (ARS), New York / VG Bild-Kunst, Bonn. © This artwork may be protected by copyright. It is posted on the site in accordance with fair use principles. 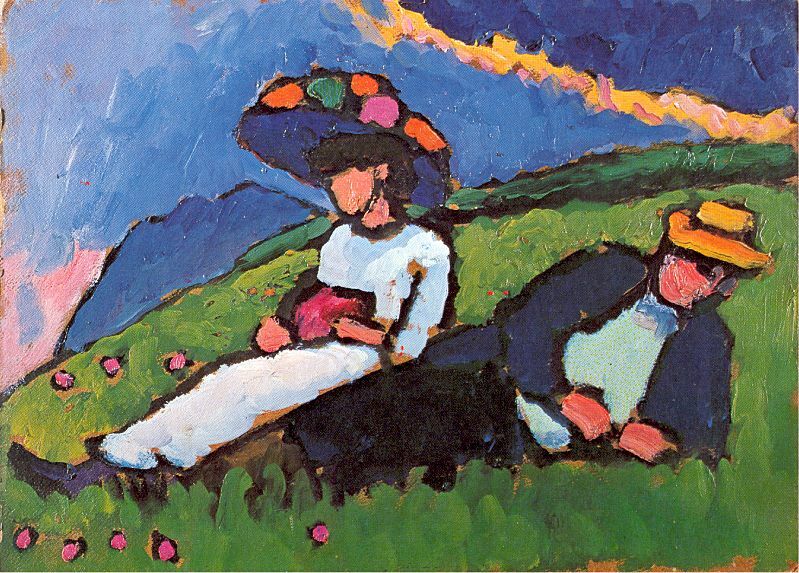 Gabriele Münter (German, Expressionism, Blaue Reiter, 1877-1962): Meditation, 1917. Oil on canvas. Stadtische Galerie im Lenbachhaus, Munich, Germany. © Artists Rights Society (ARS), New York / VG Bild-Kunst, Bonn. © This artwork may be protected by copyright. It is posted on the site in accordance with fair use principles.